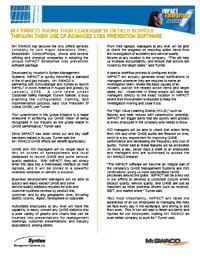 IMPACT Loss Prevention Software - Syntex Management Systems, Inc. Source: Syntex Management Systems, Inc. Developed by Houston's Syntex Management Systems, IMPACT Loss Prevention Software is quickly becoming a standard in the oil and gas industry. QHSE and ISO managers will no longer have to rely on scores of spreadsheets and local databases to record QHSE and some servicequality statistics. With IMPACT, they will simply enter this data into a Web-based interface on their laptops, and it will be stored in a powerful relational database on servers in Houston.